The [ZFC], as the noted flag historian, the late Howard Madaus stated, is the largest most important representation of U.S. and American flags in the world. Containing many important foreign flags, the ZFC is more than a large accumulation; rather it is a dynamic working collection, used for research, exhibition and educational purposes. – 430 Reference books, pamphlets, posters, and photographs relating to flags. 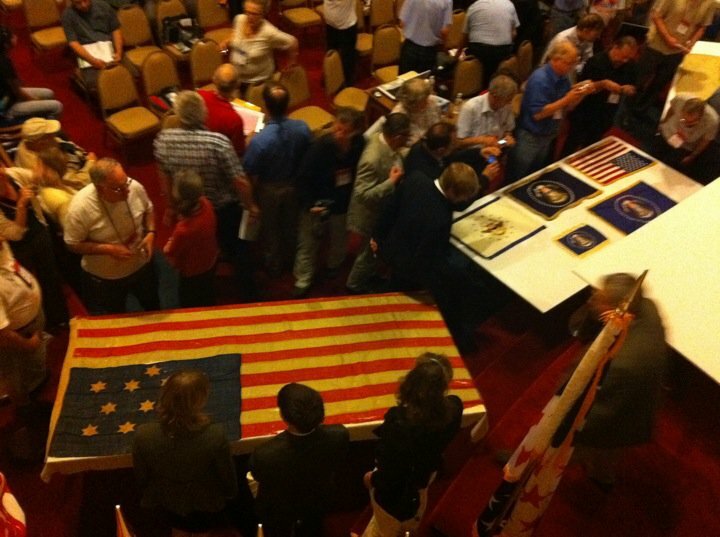 ICV 24 attendees admire flags from the ZFC. Photo by Scott Mainwaring. 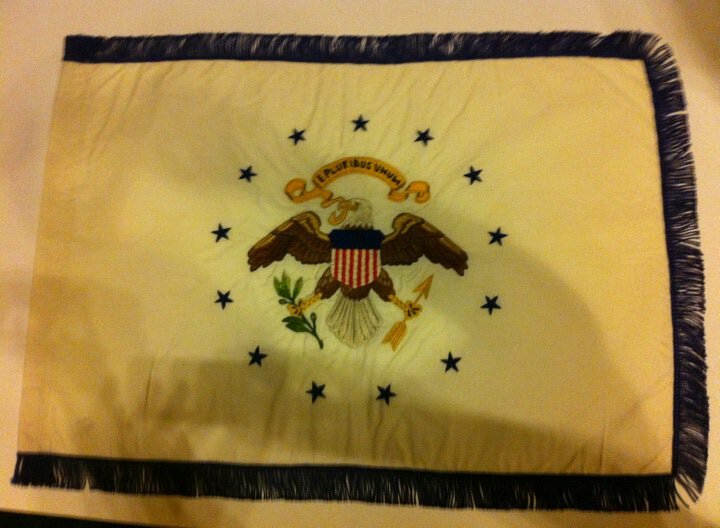 LBJ’s Vice Presidential Standard, from the ZFC. The design was used from 1948 to 1975. Photo by Scott Mainwaring. 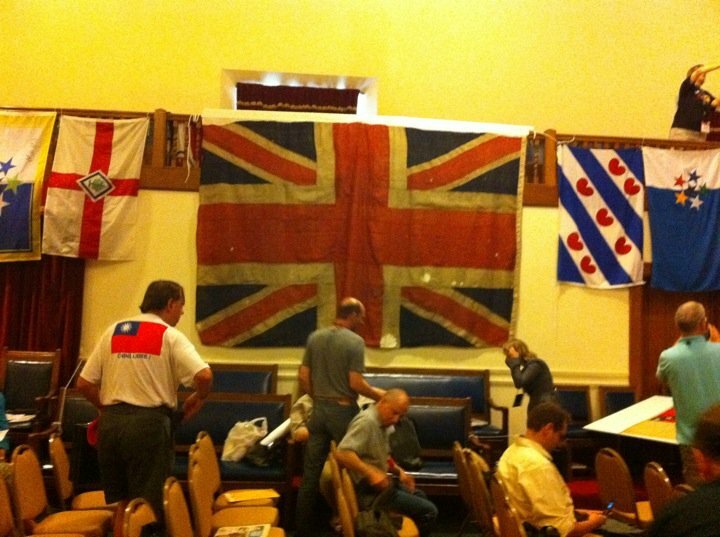 One of the many highlights of the ZFC, a British Union Jack from the Battle of Trafalgar, the only one known to survive. (Smaller flags to the side represent vexillological associations represented at the congress.) Photo by Scott Mainwaring. 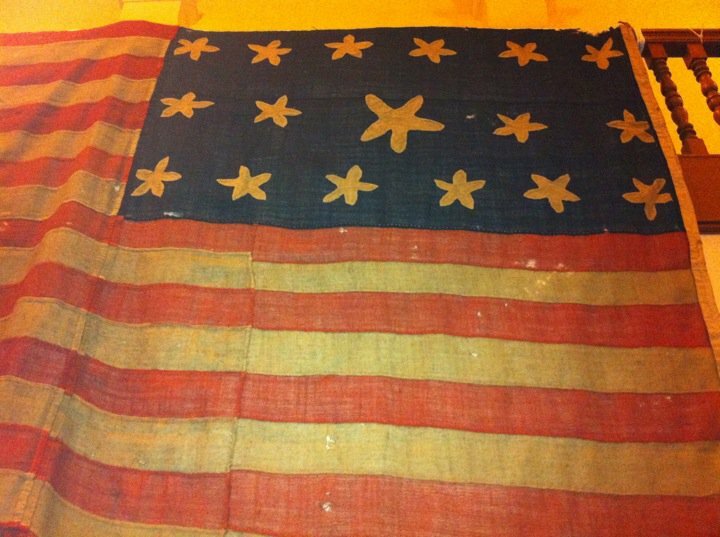 A 17-star, 17-stripe US flag from the War of 1812, exhibited by the ZFC. Photo by Scott Mainwaring. A 2003 ZFC exhibit at San Francisco’s Presidio is the subject of this short video. The ZFC was also involved in the production of an hour-long PBS documentary, also entitled The American Flag: Two Centuries of Concord & Conflict. They sell DVDs of the program in their small online store. Specially made for PBS prime-time national broadcast, a one-hour television documentary including rare archival footage, images of actual historic flags, and stirring original music, this television special is based on the book by the noted scholars Howard Madaus and Dr. Whitney Smith. The program traces the history of the American experience through the stories of Revolutionary War battle flags, Civil War flags, Custer flags, Lincoln flags, 1876 Centennial flags, President Kennedys assassination limousine flags, 9/11 flags and many more. Some of these rare, priceless artifacts will be seen for the first time publicly in this program. Historians, flag collectors and prominent Americans include Norman Lear, filmmaker Harold Ramis, activist Tom Hayden; who share stories about the flag as art, flag history and flag collecting. Revolutionary and Civil War re-enactments help bring the story of the American flag to life. Flag stories include the origin of the Pledge of Allegiance, the Sothebys auction of rare revolutionary flags, and noted flag collectors Ben Zaricor, Louise Veninga, and Kit Hinrichs. This is the definitive television program about the untold history of the American flag.